COX-1 antibody LS-C14603 is an unconjugated mouse monoclonal antibody to COX-1 (PTGS1) from human, mouse, rat and other species. Validated for ELISA, IF, IHC and WB. PTGS1 / COX-1 antibody was raised against ram testes. Recognizes COX-1at 72kD. Cross-reactivity: to a moderate degree with ovine COX-2, and minimally with human COX-2. Species cross-reactivity: ovine, human, mouse, and rat. Suitable for use in ELISA, Immunohistochemistry, Immunofluorescence and Western Blot. ELISA: 0.1-1 ug/ml. 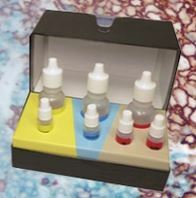 Immunohistochemistry (frozen and paraffin): 10-20 ug/ml. Immunofluorescence: 10-20 ug/ml. Western Blot: 2.5-5 ug/ml. Positive control: Human platelets, mouse and rat macrophages.